The lodge did so well that 104 new suites were added in 2007 (for a total of 405). Howlin’ Tornado, a super-fast water slide with a funnel was added in 2006 and is one of the amenities that differentiates Great Wolf’s Williamsburg property form its Poconos Mountains location. 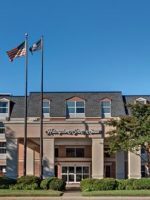 The Williamsburg resort is owned and managed by Great Wolf Resorts, Inc., the largest owner, operator and developer in the United States of indoor water park resorts. The company currently has 12 properties in the U.S. and Canada that cater to families with children ranging in age from 2 to 14. And cater to them they do. 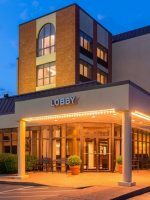 A few steps in to lobby, with its massive stone fireplace, comfy chairs, and staging area with faux animals and trees with faces, and our boys could barely stand in line long enough to check-in. Friends joined us for the weekend’s stay, and the five children between us (ranging in age from 6 to 11) were begging to explore. 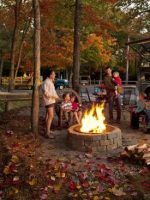 Find more Great Wolf Lodges by reading about Great Wolf Lodges. There are 10 different room configurations to choose from, including oversized rooms with lofts to three kid-themed suites: KidKamp, Wolf Den and KidCabin, each of which are designed for families with younger children. Families can also choose to stay in one of 10 QuestMaster Suites, where children's MagiQuest wands can manipulate magic chests, lamps, and stars. A stay in these suites includes two wands, and allows guests to gain points playing the game in their suite as well as throughout the resort. While a particular room assignment cannot be guaranteed, you can have the reservation agent note a preference for a room overlooking the outdoor pool, or one at the end of a hallway far away from kids playing MagiQuest, and therefore quieter for daytime nappers. Since the resort is a smoke-free facility, all rooms are non-smoking. Note: Guests are given wristbands instead of room-keys. One type of band (for parents and older kids) opens guest room doors and allows for charging privileges, while the one given to children does not. Be sure to ask for the adult type of band at check-in for children who will be coming and going from the room on their own. The Queen Sofa Suite sleeps four people. There is a queen bed, full bath, a full-size sleeper sofa, a 27-inch TV and a private balcony or patio. The room is equipped with a microwave, fridge, coffee maker and hair dryer. This room is handicap accessible. The Family Suite sleeps four, with a maximum of six people. The room has two queen beds, a full-size bath, living area with a full-size sleeper sofa, a 27-inch TV and a balcony or patio. The room is equipped with a microwave, fridge, coffee maker and hair dryer. The suites are also available with fireplaces. The Luxury King Suite sleeps four. The room has a king bed, a full-size bath, living area with a full-size sleeper sofa, a 32-inch TV and a balcony or patio. The room is equipped with a microwave, fridge, coffee maker and hair dryer. The Wolf Den Suitesleeps four, with a maximum of six. The room has a cave-themed sleeping area with a bunk bed and TV. The main area has a queen bed, a full-size bath, full-size sleeper sofa, a 27-inch TV and a balcony or patio. The room is equipped with a microwave, fridge, coffee maker and hair dryer. The KidKamp Suite sleeps four, with a maximum of six. The room has a tent-themed sleeping area with a bunk bed and TV. The main area has a queen bed, a full-size bath, full-size sleeper sofa, a 27-inch TV and a balcony or patio. The room is equipped with a microwave, fridge, coffee maker and hair dryer. The KidCabin Suite sleeps four, with a maximum of seven. 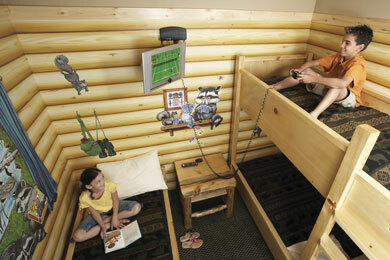 The room has a cabin-themed sleeping area with a bunk bed, day bed and TV. The main area has a queen bed, a full-size bath, full-size sleeper sofa, a 27-inch TV and a balcony or patio. The room is equipped with a microwave, fridge, coffee maker and hair dryer. The Loft Fireplace Suite sleeps four people, with a maximum of eight. The main floor has two queen beds, full bath, two 27-inch TVs, a living area with full sleeper sofa and gas fireplace. Upstairs is a queen bed, 27-inch TV and a half bath. There is also a balcony or patio. The room is equipped with a microwave, fridge, coffee maker and hair dryer. A Loft Fireplace Suite is also available with fireplace. The Majestic Bear Suite sleeps four people, with a maximum of eight. The master bedroom has a king bed and 32-inch TV. The main area has two queen beds, full sleeper sofa and 32-inch TV. There is also a private balcony or patio and a breakfast bar. The room is equipped with a microwave, fridge, coffee maker and hair dryer. The Whirlpool Fireplace Suite sleeps four people, with a king bed, full-bath, whirlpool tub, 27-inch TV, full-size sleeper sofa and private patio. The room is equipped with a microwave, fridge, coffee maker and hair dryer. The Grizzly Bear Suite sleeps four people, with a maximum of eight. There is a master bedroom with queen bed, 27-inch TV and full bath. The second bedroom has two queen beds and a 27-inch TV. The living area has a full-size sleeper sofa, full bathroom, corner fireplace, 27-inch TV and private balcony or patio. The room is equipped with a microwave, fridge, coffee maker and hair dryer. I knew this hotel had a lot of wear and tear but I was disappointed with how much. The rugs in my room are stained. The bathroom in my room has not seen a good cleaning in forever and my towel had stains. When I requested my bathroom get cleaned, I was yes to death but nothing got done. Our beds didn’t get made. I’m on vacation cleaning and making my beds. Not a place I would recommend. We visited back in Nov.. had a great time took our kids who are 24, 20 and 13 and the two grandkids who are 3 and 2. Everyone had a great time.. we adventured out for dinner to save money and packed snacks. 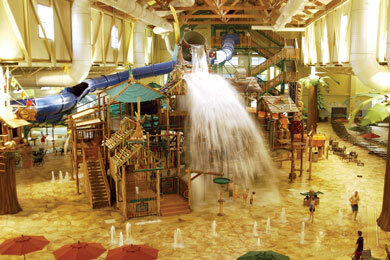 The most prominent recreation option is of course the 300,000 gallons of fun, always 84-degrees, indoor water park. Babies and toddlers can wade in shallow water and play with sprinkle bucks at a zero-entry pool located conveniently near the park's entrance. (Diaper wearers must wear waterproof swim diapers, which are available in resort stores). The waterpark is staffed by more than 100 certified lifeguards, with an average of about 20 guards per shift. Slide height requirements range from 42 to 48 inches tall. Those who are scared of the dark (whether adults or kids) should note that the fully enclosed slides are brighter inside during the day than at night. Alberta Falls is four stories tall and twists in and out of the building before dropping into a plunge pool. The tube is enclosed so the temperature doesn't change. Children under 42 inches tall must ride with an adult and can only take the double tube. The wave pool, Beaver Tail Pond, is fun for all ages with gentle waves and a pool depth that graduates from zero to five feet. Three different size life-vests are available on nearby racks as well as clear inner-tube rafts. Be prepared to accompany young children when this massive pool is crowded. It can be hard to track them from the side. Kids test their balance, jump on lily pads and try not to fall into the water in Big Foot Pass. Children under 48 inches tall are encouraged to wear a lifejacket. Play water basketball or let kids test their balance on the floating activities in the Chinook Cove Activity Pool. Float in a tube along the current of the winding, endless lazy river. Cub Paw pool allows little ones to play with spray features and swim in a 1.6-foot deep zero-entry pool. Elementary-age kids can climb, slide down open-topped slides, and get soaked by a 1,000 gallon tipping bucket at four-story Fort Mackenzie, the centerpiece of the park. Looking for a fast escape out of Fort Mackenzie tree house? Use the twin three-story Totem Towers waterslides. Howlin' Tornado is one of the most popular slides with preteens on up (and adventurous younger siblings that are at least 48 inches tall). 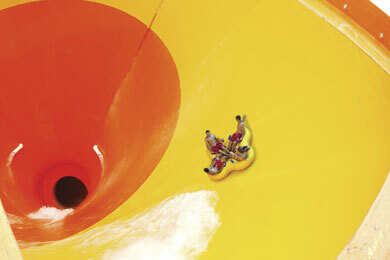 Four-person rafts sail down the Tornado and drop into a six-story funnel, where they swirl up the sides before making a splash landing in an exit pool. River Canyon Run, one of the park's signature slides, allows families to ride together in a big raft. Children must be at least 42 inches tall in order to ride. Wolf Rider Wipeout is an indoor surf simulator. Learn the basics from the lifeguards and do a kneeboard 360. Children must be 42 inches or taller to ride. 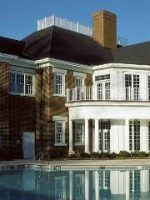 Summertime visitors can take advantage of the large outdoor pool, mini-golf course, and an outdoor bar & grill, all of which are open Memorial Day through Labor Day. Mini-golf operates on a longer season, weather-permitting, and at night with glow-in-the-dark balls. Note: the park was un-crowded with short lines and plenty of seating available on the Friday evening of our stay. Not so on Saturday. We arrived at 11:15 am and could not find a single available chair, even though there were hardly any people sitting in them. Racoon Lagoon Outdoor Pool area is typically open Memorial Day Weekend to Labor Day Weekend. The pool ranges from a zero-depth entry to four-feet deep. There is water basketball, spray features, heated water and tables and chairs. 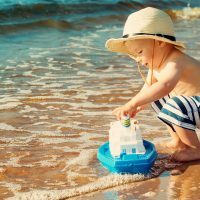 There are a number of amenities and fun for the kids that do not require swimsuits. Compete against family and friends in the interactive 4D World game. Take aim at targets in an enchanting 4D environment to gain points and receive the highest score to win. Cub Club is the resort's center for kids age 3 to 12. Here kids can participate in activities and crafts designed in conjunction with National Geographic Kids magazine. Every morning and night, gather in the Grand Lobby for The Great Clock Tower Show. See the animated characters sing and come to life. Show times are at 10AM, 8PM and 9PM. Wear your pajamas for nightly Story Time in front of the fireplace in the Grand Lobby and listen to bedtime stories. Stay afterwards to meet and get a photo with Wiley or Violet. Howl in One Mini Golf is an 18-hole outside mini-golf course. There are giant life-like beavers, floating greens and fish that will eat your golf ball if you aren't careful. It is challenging, but easy enough for the whole family to enjoy. This motion thrill ride theater puts you into the movie action. Buckle up and watch the movie as your seat twists and turns amplifying every effect and giving you a memorable experience. While the pools get the press for Great Wolf, surprisingly, what our children loved even more was a game we didn't know much about: MagiQuest, an interactive adventure game that seemed very Harry Potterish. To play each child needs to buy a wand from the MagiQuest shop ($14.99 but usable on subsequent visits), plus pay $9.99 to play the game, which includes a copy of "The Ancient Book of Wisdom" (a field guide that lists what players need to find in order to accomplish each quest). The players then run around two floors of the hotel "fighting" dragons, opening treasure boxes, finding crystals, and more, all with a flick of their magic wands. The goal? The more challenges players solve, the more points they receive, and the closer they get to becoming a "Master Magi." Our kids loved MagiQuest so much that they skipped the water park on the last morning in order to play one more level of the game. Compass Quest is an unlocked new layer of MagiQuest. A compass leads players on an interactive adventure of magic, mystery and discovery as they unveil the nine new quests. $14.99 includes compass and nine additional quests. This family-friendly arcade is full of games ranging from games of skill for older ones to games of chance for little ones. In Oliver's Time Challenge, gather friends and opponents, set the clock and race to push the most buttons as they light up. The one to push the most buttons before time runs out, gets the highest score and wins. Play again and again to see who remains the fastest player. Across the wall of Scoops Kid Spa reads "Life is like ice cream, experience every flavor before it melts away!". Scoops Kid Spa is a spa for young girls with everything themed around ice cream. Choose your favorite flavor for a pedicure or manicure, put on a tiara and pink robe and hop onto the banana split throne. There are also facials perfect for tweens. Flavored fizz soaks, sherbert scrubs and ice cream nail colors prepare your senses for the free ice cream afterwards. Try Scoops Kid Spa to celebrate birthdays or for a special treat just because. The Ten Paw Alley was made for families with little kids. It has ten short lanes, five-pound balls and no rental shoes. Kids have a blast at this bowling alley where their chances of hitting pins are greater. Great Wolf Lodge's sit down restaurant, The Loose Moose Bar & Grill offers a gourmet breakfast buffet, lunch and a dinner buffet featuring a carving station, salad bar and lots of favorites for kids. Other options for breakfast, coffee and anytime sweets are Bear Paw Sweets & Eats and Dunkin Donuts. During your day full of fun in the indoor water park, get lunch at Spirit Island Snack Shop. You can also order pizza take out from Hungry as a Wolf. The extensive room-service menu offers things like the Loose Moose Family Dinner and a dessert of six chocolate chip cookies and milk. For breakfast on the run and desserts, head to Bear Paw Sweets & Eats, located right outside the water park. Here you'll find freshly baked muffins, fruit cups, and delicious yogurts with fruit and granola, plus Starbucks coffee. On the sweeter side, there is peanut butter candy seashells, Pez dispensers, caramel covered apples, cupcakes, and Edy's ice cream served up in waffle cones. Hungry as a Wolf is a quick and easy lunch or dinner option. The menu includes homemade pizza, bread sticks, salad and a Wolf-It-Down family meal. Order take-out and pick it up on the main level, then you can take it back to your suite to eat. The Loose Moose Bar & Grill offers a gourmet buffet for breakfast (made-to-order omelets, waffles, hash browns, bacon, muffins and much more). For lunch there are soups, salads and sandwiches. Dinner buffets alternate nightly and include things like pot roast, baked chicken, roasted turkey, and pasta dishes. This sit-down restaurant provides crayons and menus with mazes and word searches. Spirit Island Snack Shop, in the water park, sells pizza, nachos, french-fries and ice-cream. It's a convenient choice to feed everyone without having to leave the park. Mandy, the concierge on duty, provided excellent guidance on what to do in Williamsburg: If you have just a few hours to spare, head to Jamestown (more interactive for younger kids, with good restaurants) nearby. Go to Colonial Williamsburg if you have elementary-age children or older and can devote an entire day to get your money's worth out of the tickets. Avoid the lines at each park (and get a small discount off Colonial Williamsburg) when you buy tickets through the concierge. 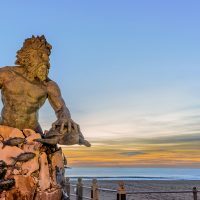 The resort is located off Route I-64 between Richmond and Norfolk, VA, a 2 1/2 hour drive from Washington, D.C., a one-hour drive from Richmond, VA, and 51 miles from Norfolk International Airport. Parking is free. Busiest times are when children are out of school for summer and school breaks. May and September are the best times to find low rates. Sunday through Thursday nights, year-round, typically cost less than weekends, with the exception of holiday times. Check-in is at 4 p.m., or as rooms are available. Check-out is at 11 a.m., however, families can use the water park anytime after 1 p.m. on the day of arrival, and also until closing time on the day of departure. There are lockers in which to keep your belongings after you check out. 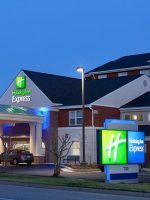 Reservations require an advance deposit of one-night's room and tax charges. Cancellations received more than 72 hours prior to arrival will be refunded the deposit less a $25 processing fee. If your plans change within 72 hours, and you rebook your trip for different dates, your deposit is transferred to the new dates. Cancel altogether within those 72 hours and you lose your deposit. For quiet time in the hotel your best bet is to sip a glass of wine on your room's balcony. The lobby was packed with kids well in to the evening, either watching shows, playing MagiQuest, or coming up from the water park. And since the only bar area is right off of the lobby, spending the evening there is not an intimate endeavor. Venture to downtown Williamsburg and you can walk around cobblestone streets, peak in shops, and have dinner. The Blue Talon Bistro (420 Prince George Street Williamsburg, 757-476-BLUE) is an elegant bistro that serves excellent lamb, steaks, and salmon. It is also known for its American comfort food, including the delicious and highly recommended homemade macaroni and cheese.